Area in SE Carina, centred on RA 11:13, Dec -61:14. 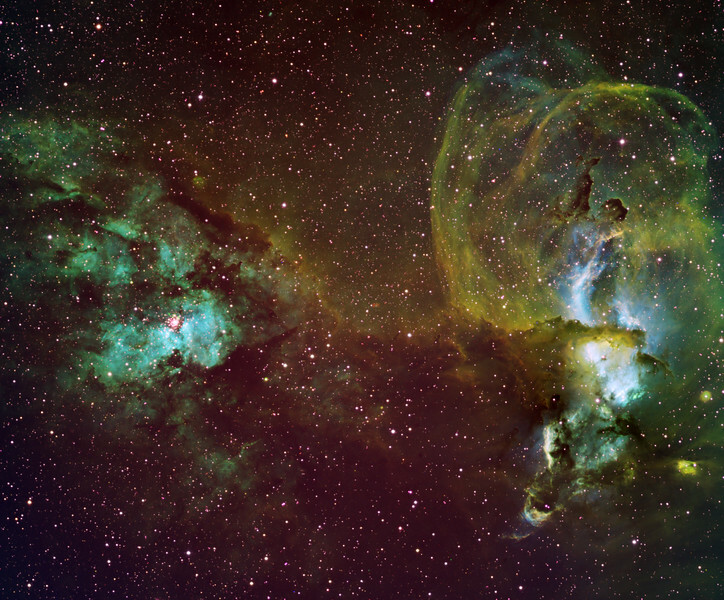 On the left is cluster NGC 3603, sitting above and perhaps illuminating an OIII-rich cavern. On the right are several NGC objects, too many to list. Bottom right, we see a Hereford cow, a celestial hoofer, tripping the light fantastic. Some see a Brunhilde-like figure standing on the head of the cow. Mike sees a black leopard, howling, standing on top of Brunhilde. Arching over the whole leopard-singer-cow complex is a covered-wagon of shock fronts, rich in H-alpha and SII. Green: H-alpha 3hrs, Blue: OIII 5hrs, Red: SII 4hrs, in 1hr subs. Aspen CG16M on 20" PlaneWave. Field 36' wide. North up.